The term customer service refers to the process of serving people, and providing help and support either before, during, or after a purchase. However, to ensure all your customers receive high-quality customer service, creating a well thought out customer service philosophy, that is directly relevant to your business, is crucial. In this article, we will consider the key fundamental elements that should underpin your customer service philosophy. And we discuss actionable tasks and strategies that you can implement to ensure that your customer service philosophy is consistent and successful. Research by Accenture found that 61% of Americans have “walked away from companies because of poor service”. Therefore, getting your customer service philosophy right is key to a healthy business. A customer service philosophy is not something that you can just create overnight. The first step is to create your company’s vision for customer service. Understands the needs of the customer. Promote the core values of the company. Ensure all staff and customers are clear on the customer service expectations. The process of determining your customer service vision should involve all staff. Your employees should truly understand and believe in the customer service philosophy of the business. This will empower them within their roles to deliver a top class service. Once you have a clear vision for your customer service philosophy, you will next need to turn this vision into a mission statement. Be a concise definition of your customer service vision. Be relevant to anyone who engages with your company, from employee to customer. Shape the ethos of all customer service policies and interactions. Here is a great example of a company mission statement from Universal Health Care Inc…. As well as a mission statement, your vision can be further broken down into guiding principles. It is these principles that will help guide your support teams who are on the frontline of customer support. Detailing expectations of customer service through a number of key principles will help to culture a customer service ethos. Employees on the frontline can then mentally refer to this ethos when providing support and dealing with any issues that may arise. Once you have decided on a vision for your customer service philosophy, you next need to decide what customer service strategies you are going to implement to ensure your service lives up to your vision. One such strategy is self-service support. Self-service support is fast becoming the go-to for the majority of the population. This involves customers accessing information on your website, instead of speaking to a customer service representative. Customers can easily find answers to their questions and solve problems themselves. Helps customers increase their knowledge of your products (in their own time and on their own terms). Minimizes contact with customer support. Research from Gartner has found that “Customer service interactions are actually 4x more likely to lead to disloyalty than lead to loyalty”. Customers, on the whole, do not like to speak with customer support. Instead they much prefer to find solutions to problems on their own. Therefore, providing a range of self-service support channels and tools is a great way to keep your customers happy, as well as taking some of the pressure off your customer service teams. Answer initial questions potential buyers may have about a product or service. Help customers determine if the product is right for them. Prevent you from losing potential customers to competitors. When designing your FAQs section, you should ensure that all basic questions customers may have are answered. Put yourself in your customer’s shoes – what would you need to know about this product before you made a purchase? A knowledge base is a must-have if you are looking to provide top-quality self-service support. In fact, Social Media Today reported that 51% of customers prefer to access support via a knowledge base. Read articles on best practice and top tips. Search for information on any question. HelpJet provides state-of-the-art knowledge base software to help you automate your customer service and consequently ensure users can quickly and easily find the information they need. Instant Live Search – The HelpJet search provides instant search results and useful suggestions for customers who aren’t quite sure what they are looking for. Easy to Customize – Ensure the HelpJet knowledge base matches your branding and website’s colors (no coding required). Works on All Devices – HelpJet’s knowledge base is fully responsive and can be accessed on desktop, laptop, mobile or tablet. In-Depth Analytics – Find out which articles are most useful to your customers, what users are searching for, what content is missing, and much more. Using an information-packed knowledge base empowers users to solve their own queries. Which, in turn, creates happy and loyal customers. Forums are another useful self-service support tool. Forums provide a space for your customers to converse amongst themselves, ask and answer questions, and discuss experiences using your product. Forums should be overseen and managed by a customer service representative from your business. Ensure forums are monitored closely and any negative issues are dealt with quickly. Learn from forum conversations to find out what your customers think about your product, what extras they would like, and where your customer service is lacking. Often customers will want, or need, to speak to a member of your customer support team. So, as well as self-service support, you will need to consider offering personalized customer support to ensure your customer service philosophy meets with success. Determining the right support channels, that work for your business and customers, will take some research. Understanding who your customers are, and what they want support-wise, will help you set up the right contact channels for them. Issue-centric vs Customer-centric – Decide whether you will solve customer problems on an issue-by-issue or case-by-case basis. 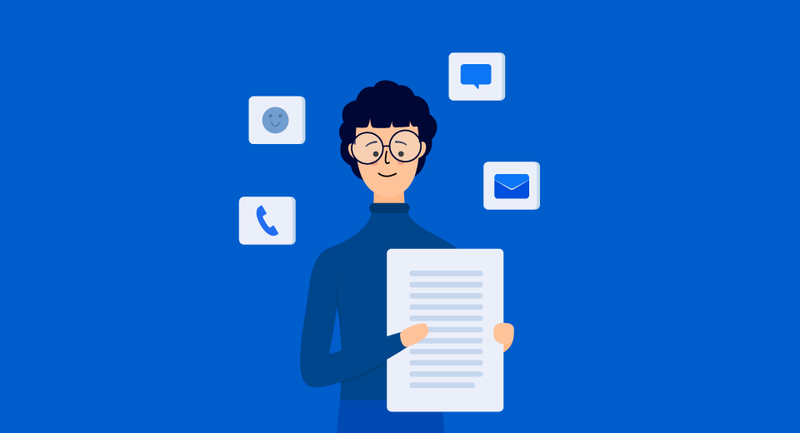 Create Detailed Support Policies – Document procedures for customer problems, including rules on returns, refunds, the chain of command, and other key areas that all employees will need to know. Ensure a Consistent Tone of Voice – Your brand’s tone of voice should be consistent across all support channels. Monitor Your Customer Support Interactions – Monitor phone calls, live chats, and more, to gain a good understanding of how your customer support representatives are performing. Share Expected Reply Times with Customers – Be honest with your customers and manage their expectations on reply times so they won’t be unduly disappointed if they don’t receive an immediate response from your company. It is also important to note that you should always give customer support staff the flexibility to work outside the box and use common sense to solve issues. Remember, by having a strong customer service philosophy, with clear principles and guidelines, you should be able to trust your staff to go off-manual to deliver excellent personalized customer support. Live chat is fast becoming the most popular way for customers to solve problems. In fact, Customer Think found that “52% of consumers are more likely to repurchase from a company who offer live chat support”. Provide a quick response time. (Live chat customers will not expect to be kept waiting more than a couple of minutes). Create stock answers that can be quickly personalized. These strategies will help to ensure the support customers receive via live chat is is fast, consistent and on-point. Providing email support is another effective way to provide personalized support that isn’t too labor intensive. Like live chat, pre-written draft emails can be created for each query type. These can then be tweaked to ensure they answer each individual question specifically. Consequently, this ensures your brand’s tone of voice is consistent, and replies are concise and helpful. For larger businesses, or for companies that are providing extensive services, phone support may be necessary. Situations where sensitive data is being handled. Directing questions to the right employee or department. Speaking on the phone is still a preferred interaction for many. Statista found that in 2017, 74% of US customers contacted customer services by phone. Therefore, customers may feel that your customer service is lacking if no phone service is offered. If this is the case, phone support may be something you should consider introducing. Proactive customer service across the social media channels will create a positive image around your brand. Ensure fast response times to questions and comments as well as helpful, thought out replies – remember responses from your customer service team can be viewed by everyone. Monitor negative sentiment to help limit damage to your brand’s reputation. It can also be helpful to use a social media analytics tool to monitor your brand across the social platforms. By understanding how your customers are reacting to your social customer service strategies, you can then make adaptations to ensure you are providing top quality customer service via social media. Once you have created your customer service philosophy and decided on systems to use, its success will ultimately depend on the implementation. Training – Consider training for all staff, not just for your customer service teams. This will consequently promote the importance of your brand’s customer service philosophy, and ensure it becomes a fundamental element of your business, valued by all. Reviewing – The values and principles of your customer service philosophy should be at the heart of every employee’s review. Therefore, during reviews, discuss and address problems staff have encountered with implementing the customer service philosophy. Incentivizing – Impressive customer service should be acknowledged and praised. Pay rises, further responsibility, as well as promotions, should all be awarded in-line with your customer service values. This will help ensure staff understand the importance your business places on customer service. Hiring – New staff should be hired in accordance with customer service expectations. At the interview stage, take the time to share your customer service philosophy with potential new staff. Selections should then be based on whether potential employees would fit with your customer service vision and ethos. It is also crucial that you know exactly what type of support your customers are receiving. Tracking customer sentiment about your brand, and using strategies like customer surveys, can provide useful information on customer service. The experience we deliver to the customer is of the utmost importance to any business. Creating a customer service philosophy will help your business consistently deliver excellent customer care. Crucially, a customer service philosophy will ensure staff understand the importance of top quality customer service. And it will, therefore, empower them will help them deliver a service that routinely exceeds customers’ expectations.